It’s not a spoiler to say something wrought by The Sixth Sense’s M. Night Shyamalan has twists. This is useful, because Wayward Pines, his series adapted from the books by Blake Crouch, is chock full o’ twists. We’ve seen the first half of the 10-episode season, and these are our (spoiler-free!) first impressions. From its very first scenes, the show (which begins May 14 on Fox) has no compunction about broadcasting its influences. Episode one, “Where Paradise Is Home,” is directed by Shyamalan, who’s also one of the series’ executive producers. It’s a blend of elements cherry-picked from The X-Files, Twin Peaks, Misery, Lost, The Truman Show, The Prisoner, Shyamalan’s own The Village, and probably more. From those titles, and from the trailer at the end of this post, you’ll get an idea of Wayward Pines’ starting point. But forget about trying to anticipate what comes next, because TWISTS. Matt Dillon heads up an impressive cast (including Juliette Lewis, Melissa Leo, Toby Jones, Terrence Howard, and Hope Davis) as Secret Service Agent Ethan Burke. We first see him in an upside-down shot, conveying his disorientation, which is perfectly understandable given the circumstances. He’s alone in a forest with a mangled face and vague memories of a road accident; his partner, who was in the car with him, is nowhere to be found. We get some flashbacks to learn a little more about Ethan. Seems that prior to smashing into a windshield, he was on a mission to locate a pair of MIA agents, one of whom was his former partner and not-so-former extramarital flame, Kate Hewson (Carla Gugino). He’s also apparently carrying immense guilt over not preventing a deadly bombing, though he’s assured by more than one character that it wasn’t his fault. 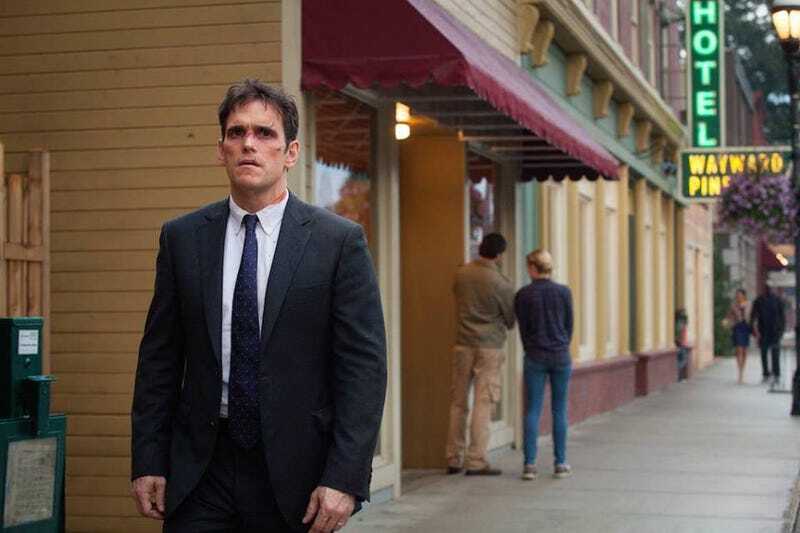 But the past is less important than what he’s about to encounter in the nearest town: Wayward Pines, Idaho, a picture-perfect burg complete with a twee Main Street, townsfolk whose smiles barely mask their fear, and rows of snug houses seemingly ripped from a Thomas Kinkade painting. In other words, it couldn’t be more weird or sinister. Surveillance and paranoia are big, timely themes here. Trees and nature blanket the town, but the whole place feels completely airless and on edge. What’s going on below the surface? The intriguing cast is a big part of the show’s allure, and a big reason why its mostly one-note characters don’t feel like cardboard cut-outs. The standouts are Leo, as Wayward Pines’ sadistic nurse who seems to know all its dark secrets, and Howard, who makes for a convincingly menacing sheriff, though his ice cream obsession feels a bit like forced quirkiness. There’s a big star with a distinctive voice who cameos as the “secretary” Ethan reaches every time he tries to contact his Secret Service bosses, which is a nice touch. The directing is also appropriately cinematic; Shyamalan steps aside after episode one, but two of the next four eps are helmed by Zal Batmanglij, whose credits include thriller The East and cult drama Sound of My Voice. We’ll definitely keep watching the rest of the series. It’s derivative and not without flaws, but it’s atmospheric, entertaining as hell, and it takes some genuinely freaky hairpin turns. (Any show that makes us scream “WHAT. IS. HAPPENING? ?” at the screen is something we’ll never abandon.) If nothing else, we’re dying to find out where all this craziness is taking Ethan, and us. Surely more twists await!